From its arresting opening – a sort of trailer for the movie to come set to a song performed by star Lee Van Cleef – to its giddily violent climax, the 1971 Western Captain Apache is a genre enthusiast’s delight. Consistently inventive and often very, very funny, it’s an energetic and underrated Western from perhaps the most energetic and underrated period for Westerns. Although conventional wisdom has it that after The Wild Bunch the genre essentially dwindled away for over a decade, the 1970s seem to me in retrospect to be the most fertile era the Western genre ever saw – reinvigorated by the combination of the Italian practitioners’ additions to the form’s language and both angered and saddened by the fallout of Vietnam and Watergate, filmmakers as varied as Sidney Poitier (Buck and the Preacher), Robert Aldrich (Ulzana’s Raid), Arthur Penn (Little Big Man and The Missouri Breaks) and, of course, Clint Eastwood (High Plains Drifter, The Outlaw Josey Wales) developed the assumptions of their predecessors – and in some cases demolished them – to create a rich new American mythology. While most cinephiles are familiar with the contributions of Eastwood, Peckinpah, etc., what really made the 1970s a smashing time for Westerns were the second-tier gems by less known directors like Captain Apache’s Alexander Singer. You had Paul Bogart’s The Skin Game (a major influence on Tarantino’s Django Unchained), any number of Westerns by Burt Kennedy…the list goes on and on. What unites many of these films is their sly, sardonic sense of humor, and this is especially true of the hilarious Captain Apache. Singer, who was primarily a journeyman TV director, takes full advantage of the opportunities for comedy presented by Philip Yordan and Milton Sperling’s script, making his film as much a study in eccentric human behavior as an action film – yet the action is terrific, expertly staged and edited with a real force to the violence. 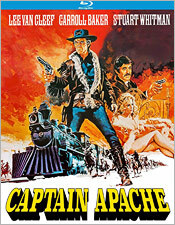 Scenes like the one where Van Cleef takes on a railroad car full of enemies with a gun in one hand and a hatchet in the other are handled with deft visual skill and tonal balance – the film is never so funny that it loses its tension, but never so violent that it loses its light touch. A lot of this is thanks to the terrific performance by Van Cleef in the title role, as a Native American US Army officer trying to solve the murder of an Indian Affairs commissioner. The identities of the killers become apparent relatively early on, but a mystery remains: what did his dying words, “April morning,” mean? As Van Cleef investigates, he stumbles onto a conspiracy to kill President Grant and encounters a variety of highly idiosyncratic characters, including an ostensible love interest (Carroll Baker, who shares some of the most peculiar romantic moments in any movie with Van Cleef) and an unscrupulous gunrunner (Stuart Whitman). Van Cleef’s wry delivery throughout these scenes, combined with his typically commanding physical presence, makes Captain Apache a truly iconic hero – or at least he should have been. In a more ideal world we would have had a whole series of Captain Apache movies, but at least we have this one, and it’s now available on Blu-ray after years of relative inaccessibility. The transfer itself is serviceable at best – the source material is pretty uneven, and the color, contrast, and clarity are competently handled but nothing remarkable. The same goes for the sound, which is a bit muddled at times, but solid overall. There are no extras aside from a pair of trailers for other Lee Van Cleef Westerns available from Kino Lorber.